Wow this has come around fast. Tomorrow I’m going to be offering Shiatsu massage tasters in Exmouth at this veer exciting looking event. Feels a bit different to the other events I have done & I love the focus – lets s upportr the community to be happy & healthy. Really excited about giving Shiatsu Masage taster sessions at this event on Sunday. It’s in Exmouth, just a short train trip from Exeter. There are loads of exhibitors, workshops & tasters on offer. There are activities for kids & it is all focussed on helping Exmouth be a happy & healthy community. Well today has been pretty miserable, cold & mostly wet. I’ve had a lovely day giving toasty, warm Shiatsu massages in my practice room in Exeter. Shiatsu can be great at getting the body going, whether it’s poor circulation, or remedying inertia, or rehabilitation after an injury or accident, or moving on from emotional distress. Today my clients were warmed & ready to face whatever this very inconsistent Autumn is going to throw at us! Stress can dramatically affect people’s lives & it is a hard thing to manage on your own. Shiatsu is a supportive form of hands-on therapy that may help with stress, anxiety & other emotional distress. At the beginning of a Shiatsu treatment there is a quick consultation, then as much hands-on treatment as time allows. There is little or no discussion whilst the treatment takes place, giving the client a chance to listen to their body, to feel where & how the stress is affecting them. As Shiatsu provides a safe & secure space, feelings, emotions, distress can be released, generally with a sense of relief or of positive release. Our bodies hold a physical imprint of the stresses & strains we experience in life, sometimes it is important to talk through these issues, sometimes it is helpful to just feel them & sometimes using a talking therapy alongside a hands-on therapy can be helpful. Shiatsu can involve a level of conversation if the client requests it, I have had clients who have found greater release in discussing what they are experiencing as the massage goes along. I have experienced clients build a sense of control & confidence after a few Shiatsu treatments. Instead of feeling that they are at the mercy of their condition or situation they feel they are taking action to make changes. Shiatsu is such a supportive therapy, they can build their confidence up knowing they have a space which is confidential & constructive. Shiatsu works to balance the energies in the body. As these energies come into balance there can be a greater sense of flow & movement in the body, mind & emotions. Clients have commented that they felt energized & revitalized after a Shiatsu massage. This new found energy, alongside a safe space, can allow people to feel confident enough to start making changes, break patterns & learn new ways to support themselves. If you are interested in discussing if Shiatsu may of help to you then do get in touch, details on the ‘contact me’ page. I’m always happy to talk Shiatsu. I work in Exeter & Dawlish, in Devon. I’m going to be at this great community event in Exmouth on Sunday. I’ll be giving Shiatsu tasters but there’s going to loads to do – all focused on supporting the town to be healthy & happy. There are workshops for adults & kids & loads of things to see & try out. It’s only a short trip from Exeter on the train & a beautiful journey down the estuary. A relaxing way to travel to an event that will hopefully leave you feeling chilled out & happy. Well my official start offering Shiatsu massage on a Tuesday hasn’t started off so well – I’ve had a cancellation this week, my first Tuesday appointment! On a more positive note I am now able to offer two appointments on a Tuesday, with the aim of building up to a full day of appointments. 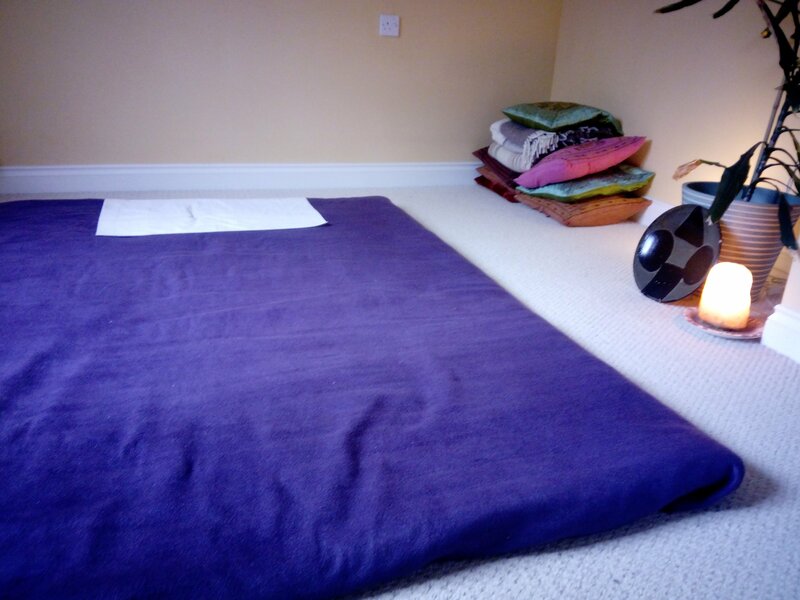 So I have two spaces this week if anyone fancies a Shiatsu with me! I feel positive about working more days & I’m sure I will begin to book up. It is a strange thing, starting a new business or expanding a business. I remember, when I first started, sitting wondering where my clients would come from. They did come, from various different forms of promotion, & so I feel a little more confident this time! You don’t get anywhere not doing anything though do you, it’s better to act than not, so here’s to new ventures & adventures. I love Shiatsu, & yes I’m looking to make a living from it, but my primary motivation when looking for new clients isn’t to get money it is to help support them with Shiatsu. It is a form of therapy that is suitable for all & can really help with a whole load of complaints, concerns or issues. It is so versatile, supporting on a physical, mental, emotional & mental level. I want to help support people using Shiatsu, I can see that Shiatsu may well help them & I would like them to try it! There isn’t really a culture in this country of looking after ourselves. Often we don’t have the money to spare to have hands-on therapies. Sometimes there isn’t the confidence that complementary medicine may help. I have met a number of clients who have recognised the importance of hands-on therapy, often they are older, & Shiatsu has helped them keep fit & well, or manage chronic pain. It doesn’t have to be Shiatsu, some people instantly fall in love with this form of therapy & others can take it or leave it. Different people enjoy & benefit from different therapies, it’s good to find one that suits & use it support yourself. Hopefully, in a few weeks time, I will be blogging about lots of new Shiatsu massage clients who come & see me on a Tuesday, to support themselves in their lives , who love Shiatsu & who benefit from it. In the meantime if there’s something you are umming & ahhing about why don’t you go ahead & put yourself out there, what’s the worst that could happen? I’m not trying to be clever or preachy, or patronising, I have been so reticent about promoting myself so I’m just trying to support others. Someone said something similar to me, & it really helped.